Pour 12 ounce IPA into a medium bowl, whisk in 2 cups of flour, one cup at a time, until smooth. Add garlic powder, onion powder, and paprika. Whisk and let sit for 10 minutes while prepping the fish. Place 1/2 cup of flour on a plate. Set aside. In a large dutch oven or cast iron skillet, bring 1/2 – 1 inch of oil to 365° F. If you don’t have a candy thermometer, place on medium-high heat for 5-7 minutes until oil is hot (you can test by adding a small sliver of fish, you want it to simmer vigorously when fish is added). Meanwhile, cut the cod filet into 4 equal pieces, pat dry with a paper towel and season with salt and pepper. 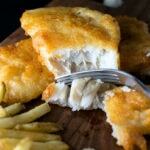 Dredge cod filets in flour, and then submerge in the beer batter. Let excess drip off and then immediately transfer to the oil. Fry each piece for 3-4 minutes per side, flipping once until golden brown. Place cod filets on a paper towel lined plate to drain for 5 minutes before serving. Serve with lemon wedges, ketchup, tarter sauce, and rosemary fries.